It should come as no surprise that Ultra High Definition and 4K TVs are the most popular TV types on the market today. That said, many people are left confused regarding which ones to go with and in some cases the confusion is heightened even further by the use of ‘4K’ and ‘Ultra HD TV’ interchangeably when discussing certain products. The main difference between the two is that 4K TVs display images in a resolution of 4096 x 2160 whilst Ultra HD TVs display the images in 3840 X 2160 resolution – just a little bit lower. When in use, it is near impossible for the average user to notice any substantial difference; however, this hasn’t stopped companies from using Ultra HD instead of 4K. Why don’t they just complete the Ultra HD resolution to full 4K you ask? There are many answers to that question but key among them is consumer preference. 4K TVs usually come in large sizes and some consumers generally want something smaller. TV manufacturers cater to customer demand by slightly reducing the resolution to come up with a smaller screen (55 inches). Although this is not to say that there aren’t any big-screen “Ultra HD” TVs in the market. The display on a 4K TV is often very detailed. The difference between it and your standard full 1080p HD TV can be visually astonishing, so if you want more detail and improved picture quality a 4K TV or Ultra HD TV is the way to go. The higher pixel density also means you can get much closer to your TV without seeing the grid-like structure of the image itself. This will allow you to watch screens larger than your current Full HD TV without having to change your seating position. 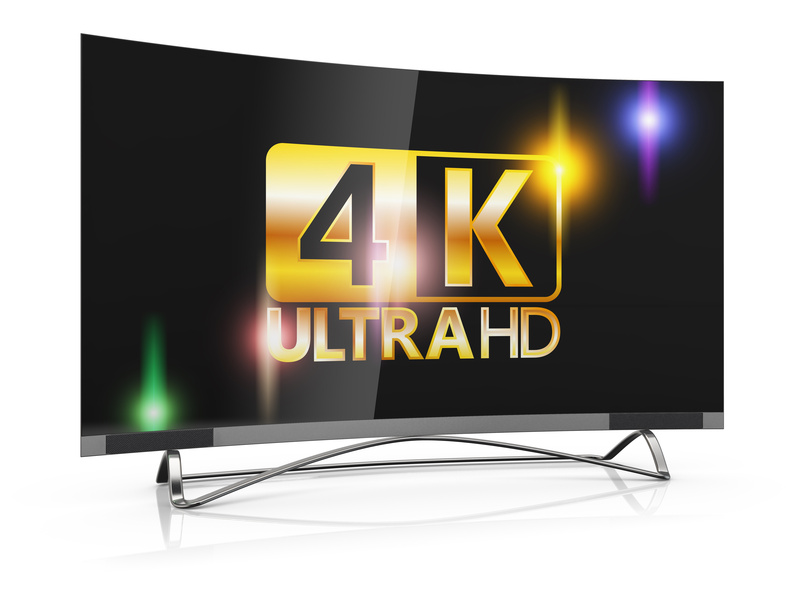 What does it cost to get a 4K or an Ultra HD TV? In the early days of the technology, it basically fell to the premiership footballers and film stars to adorn their living rooms with these fancy televisions. When they first hit the market, they could cost as much as £35,000 and even if you could shell out such amount, you needed to be sure there was enough space in your home for one -they were only available in 85+ inches! Prices have since fallen, though and screen sizes are smaller. A top-end 65-inch 4K TV today may only set you back £2,500. How far can I sit from a 4K TV for the best experience? Here, at A Clearer Picture, it is our experience that the best distance to view a 65-inch 4K TV is around 1.5m. For screens larger than 65-inch, the optimum distance is 2-3m. If this is impractical for you, consider opting for screens lower than 65-inch or perhaps rearranging the furniture around your home. High Gain aerial mounted on Chimney. Install 12 way delta switch to combine Aerial and satellite signal in all 5 rooms of the house. Its human nature to seek the opinions of others when it comes to parting with our cash, nowadays that particular habit is made all the easier by reading online customer reviews or referring to specific forums. The trouble with seeking information and validation online is that there’s often no way to prove authenticity, and find out what is true and what isn’t. This difficulty in proving accuracy occurs everywhere, even when it comes to TV aerial installation. With that in mind, we’ve listed some of the myths debunked by aerial experts below. This is one of the most popular myths flying around today. The truth however, is that digital TV aerials do not exist. The types of aerials you can find include YAGI aerials, grid aerials, high gain aerials, log periodic aerials, grouped aerials and wideband aerials. What to these all have in common? They’re all equally capable of receiving digital and analogue signals without any issues, meaning your old wideband aerial can work perfectly without any need to shell out more cash. This particular rumour is why many people are fixated on higher gain aerials, while in reality the gain of an aerial has no effect over picture quality at all. Digital picture quality is, essentially, binary: it’ll either work or it won’t, with very little middle ground. There is a specified range of signal strength required for high picture quality but this will need to be coupled with good signal-to-noise ratio (SNR). A strong signal with low SNR will still cause viewing difficulties, regardless of the aerial gain. During TV aerial installations, experts focus on ensuring that SNR is as high as possible and that the signal strength can cope with occasional fluctuations. With TV aerials, like anything else you read on the internet, you should seek the opinion of experts where possible before making a purchase. This could mark the difference between recognising a myth, like those listed above, and dropping money on something that doesn’t work. Security cameras have quickly become a normal fixture in terms of business safety, and are widely regarded as the most efficient manner of protecting your premises, but choosing which camera is best for you can become a serious headache. The best option for many businesses is to consult with a security camera expert, and have them take a look at your location. However, before letting an expert run you through a confusing catalogue of equipment, you might want to first read this list of some of the best cameras available on the market today. Pan-Tilt-Zoom cameras are usually the best choice for spaces such as parking lots, retail business premises, educational environments, airports, casinos etc. Modern PTZ cameras feature powerful motorized zoom lenses, high resolution video capture and high speed motors that make it possible for the camera to be repositioned 360° in just a few seconds. This flexibility makes PTZ cameras ideal for cramped spaces, whilst also saving money on having to install multiple stationary cameras to capture different angles. Varifocal security cameras are popular with business owners due to the ease of installation and the improved flexibility in comparison to fixed lens cameras. These cameras feature built-in diverse focal lengths that are flexible enough to alter the camera’s field of view with zero fuss. Changing the field of view on a fixed lens camera usually means un-installing the camera and re-installing it to achieve the desired focal length – which is not only a huge, impractical hassle, but can damage the equipment when repeated over time. We all behave differently when we know we’re being filmed; in fact, there is ample evidence to show that criminals are often deterred by simply seeing a camera, regardless of whether it has seen them. A hidden camera provides business owners with a layer of security that means they’ll always see the true nature of those approaching their premises. Hidden cameras are generally disguised as or found in everyday objects such as smoke detectors, flood lights or thermostats, rendering them completely undetectable. Infrared cameras offer a great deal of flexibility, round the clock, owing to the fact that they capture video in low light and at night. They are available in a wide range of different models, meaning you can really specify and narrow down the one that’s right for your premises. More advanced cameras come with newer technology like Smart IR and Full Frame Illumination which are vital for very low light capture. Similar in principle to hidden cameras, these are used in situations where disguise is desired, such as financial institutions. Bullet cameras are sometimes known colloquially as lipstick cameras in some quarters due to their slim and tubular form factor. A decent bullet camera is much less conspicuous than standard box cameras and, usually, more affordable than hidden cameras. Dome cameras are best for monitoring lobbies and reception areas like hallways, open office spaces, warehouses and driveways and can be wall or ceiling mounted, depending on your requirements. The design factor for these cameras is unobtrusive. The true beauty of these machines is that it’s difficult to know which direction the actual lens is facing, making it difficult for a savvy criminal to work around it. Most dome cameras are also adequately fortified against vandalism and physical impact. CCTV is a vital security measure for those serious about protecting their business, customers, staff and wares; now all you have to do is choose the right one! It’s been the literal focus point of living rooms for decades, often the magnetic centre that families gravitate towards in the evenings or weekends… We’re, of course, talking about the humble household television. However, manufacturers are gleefully aware of the importance the television holds over the typical family household, and as such the once humble television has now expanded into a huge, daunting range of ostentatious designs, cutting-edge technologies, stunning visuals, complicated equipment and rumbling sound systems. This is fantastic for the average consumer who adores having choice and variety in their purchases, but it also means that many potential customers are left in utter confusion about which model to buy, and which technology is the one for them. One of the most common choices facing buyers looking to purchase a high quality television is the decision between an LCD TV and LED TV. So we’re going to take a look at both of them and discuss what they mean for you and your wallet. Many people spend time working out the merits and drawbacks of both types of televisions and rightfully so; with the high price of most modern televisions, it’s foolish to make the financial jump uninformed. In comparison to LCD TVs, LED TVs offer reduced heat dissipation, thinner panels, amazing contrasts, great display and high levels of energy efficiency. The main difference between the two types is the way in which light is emitted, for example, LEDs feature light-emitting diode technology. This allows them to be used in unconventional environments such as stages or outdoor billboards (where exterior light would usually make it difficult to see what’s on screen). Whereas LCDs rely on cathode fluorescent lights (CCFLs) to emit light – which can, over time, sometimes result in ‘burn in’ (basically a deterioration of the cathode tubes). So which is better for you? TV experts note that LEDs are more popular today because of the light emitting technology and the benefits that it affords but if you are on the lookout for quality HDTV on a relatively tight budget, LCD TVs are still a perfectly viable option. When making your decision, you want to take a few things into consideration – namely the price of your television. Generally speaking LCD TVs might be the cheaper option, but then you must consider how long this purchase might last in comparison to a more expensive LED model. Is the higher investment worth it in the long run? You also want to keep in mind issues like screen size, power consumption, thickness, and reliability. LED TVs tend to be very thin and use far less energy than LCD TVs. They can also guarantee over 100,000 hours of crisp functionality, but they come with that higher cost mark-up. An expert TV installer will be able to advise you on your purchase, and take into consideration your specific needs and expectations from your purchase; but now you can approach them armed with the knowledge of what differentiates an LCD TV from an LED TV. Caught up in the excitement, stress and rapidity of starting up a new business, the focus can often fall on the larger issues at hand: location, local customer awareness, a good network of suppliers. Yet, arguably one of the most important factors isn’t considered until the last minute… security. A hurried, slap-dash attitude toward your business’ security isn’t going to deter a determined criminal, nor offer you any substantial security or peace of mind in the event of a break-in. It’s all a matter of adequate planning and research well in advance. Often, the best course of action is opt for commercial security (CCTV, high-tech alarm systems etc. ), and here are our top three reasons why that’s the case. Commercial security systems are usually thought of as a means to catch someone who has already wronged us, for identifying criminals and supplying evidence to the police. Absolutely, this is a huge part of their protective powers, but often we overlook the fact that serious looking security systems can actually scare off anyone thinking of intruding or robbing your premises. There have been many cases of CCTV cameras and daunting alarms systems chasing off a would-be criminal on sight. Indeed, many businesses install decoy or dummy cameras for this very effect (although, we would not recommend this tactic, as it gambles with your business’ safety). That said, of course in the event of a crime taking place it is vital that your business has the capability to identify the criminal(s). Since most crimes happen outside of working hours, it is near impossible to identify or catch a crime-in-action if you do not have high definition CCTV cameras tailored specifically for your premises. Criminal court cases require conclusive evidence, usually in the form of video that can clearly identify the accused culprits. This means that not only will you need some form of CCTV, but that you’ll need the correct form of CCTV, with the best quality of footage in order adequately identify suspects. Your customers and staff will feel a lot more at ease when they see the visible efforts you have made to ensure their safety. CCTV cameras and alarms will not only make them feel safe but it will also reduce the chances of criminals trying anything with your staff or customers, during working hours. This added layer of confidence will promote good business relationships with your customers, and help to ensure return business. It’s vital for a successful business to guarantee customer and staff safety, as well as security of the premises itself; don’t leave this hugely important aspect until it’s too late – consider your commercial security options early on, and you’ll set a strong foundation for the future of your company. Installing a video security system is the most efficient way of ensuring safety for your home or business; in our technology enlightened age, it has essentially become the go-to security measure – and for good reason. However, many people don’t realise that these systems require regular maintenance in order to keep them running throughout the year, especially in the colder winter months. With that in mind, we’re going to highlight some of the best cold weather maintenance tips, as highlighted by security experts. It’s the simplest, most obvious issue, and yet we often overlook it. Physical obstructions will render even the most advanced video security system completely useless. The biggest culprit is the natural landscape around the cameras: trees, shrubs and general detritus from bad weather conditions (think branches blowing off of trees). Seeing as we’re focusing on the winter months, however, it’s also worth thinking twice about where you hang holiday decorations and always make sure that winter weather, such as snow or ice, won’t impede the security camera’s line of sight. As we’ve already highlighted, winter means bad weather: snow storms, ice, gale-force winds. These issues often result in power outages which could easily cut the feed from video security systems (and may even go unnoticed for a time). Keeping a constant eye on power levels will ensure that you get the most from your system. Video security system experts add that you should use a voltmeter to ensure that your systems aren’t getting too much power or too little power. Excessive or inadequate power means your system will not be able to capture videos in the first place, and could even damage your equipment! If your video recorder has accumulated dust, wipe it with a clean microfiber cloth. Alternatively, get a can of compressed air and blow air into the recorder’s enclosure. Dust is not only a visual issue, but it can damage the inner workings of your video system. Signs of damage or corrosion are evidence that your camera connectors are not in great shape. To get the most efficiency from your system, you need to be regularly checking the condition of connectors, wires and exposed inner workings. Cable fraying is very common wear and tear for video systems and the winter period is a time when moisture can easily seep through the wires and damage the entire setup. Experts suggest that you create a U-shape with your cables, to ensure no water or melting snow can collect inside the camera itself. Additionally, any exposed wires need to be replaced as soon as possible! A camera enclosure offers a first layer of protection for your security cameras. A good enclosure will provide a water tight shield from the elements – especially useful during the harsh winter weather – and will give you less maintenance to worry about in the long run. If you have security cameras that often fail in the face of cold temperatures, it may be time to install cameras built to handle the harsh weather conditions. Most of these types of cameras feature built-in heater and temperature regulation mechanisms that allow them to work efficiently in even the harshest conditions. Much like camera enclosures; this is really a case of having the right equipment for the right job. A serious video security system requires a serious attitude towards maintenance and repair – with the right tips, equipment and know-how you’ll be able to carry on through cold or dismal weather without any hiccups in your cameras’ efficiency.